Christine Nichols has built her career on listening and watching. She understands artists' approach to their work, whether it be works on paper or formed by fiberglass. She is careful in her curating, generous in her exhibitions of their work as she studies their methods. She embraces their marks as she creates room for them breathe in her space, called c.nichols project. It's a special environment in her gallery and in her back parking lot too, usually featuring tasty food (green and good) and various quenching beverages alongside her fully stocked and prepared surf van. It's a great place to rest after a days-long hunt for decent art. Her latest show, featuring Lisa Rosel, Laura London, and Kathleen Johnson is called Trio. Kathleen Johnson has created Mars-like landscapes that carry you into the loneliness of an empty planet. They are part of her work as a member of a "crew rotation" at Mars Desert Research Station in Southern Utah in 2004. Laura London's work in this show focuses on a single model, using somewhat filmic techniques in her approach to the subject, in created spaces that reflect her use of effectively theatrical elements of placement, costume, and presence. 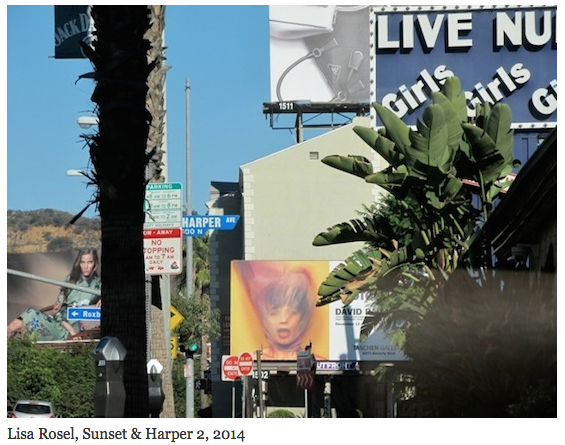 Lisa Rosel's work reflects a need to prowl and photograph her territory, capturing elements of the female form and pose in advertising in it's various incantations throughout her beloved Sunset Strip and other parts of her world. She'll often take photographs while driving with a longish focal length on her camera, compressing the images that crop up in ways that make you aware of the environment, the flora and fauna the advertisements live in. And live they do. Sometimes she'll jump out of her car to capture an image as she waits at a light. Time is fleeting. 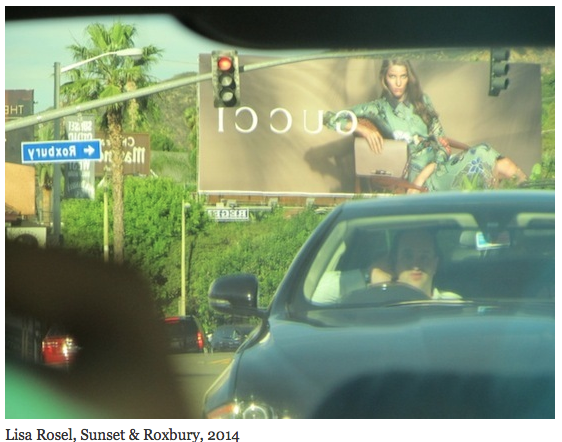 These images have a tendency to give the impression the women are watching you, challenging you to confront them, as if you're on safari -- in the odyssey that is LA. The show is up until May 2. 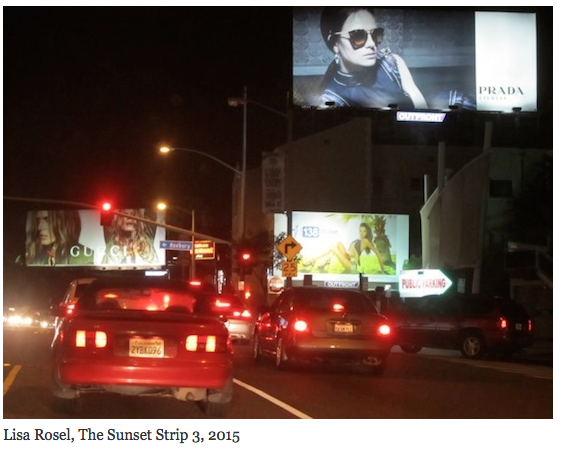 Go see it before the sun goes down. c.nichols project is located at 12603 1/2 Venice Blvd. Los Angeles, CA 90066. Emial info@cnicholsproject.com for information.